Customized by Regan O'Keefe sometime in the early-to-mid-1990s? This is the first remake/rehair project I ever completed. Back when we called them R/R/H! 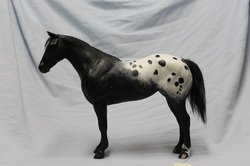 She was redone to a bit more of a correct trot and a changed head shape to be a Morgan mare in 1993 or so. 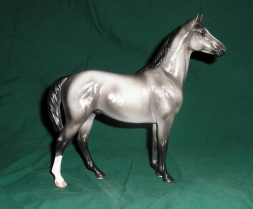 Breyer Swaps painted to a roaning out grey by Carol Herden. 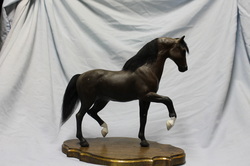 Peter Stone Arabian repositioned and finished by Sue Kern of Sakori Customs. Photo by Jennifer Buxton. Halter was made by Lisa Salamandick and is owned by Jennifer Buxton.